Sometimes called an alcove or nook, niches refer to small, plastered cutouts in bale walls. They are often used for highlighting the shape of a neighboring window or design feature, or for displaying articles of importance to the homeowners. How ever they are used, they offer a humble yet dramatic design detail to any building. It is important to consider whether or not there will be niches in the home before you get too far along in the baling process. Once the wire mesh has been applied to the walls, the creation of a niche becomes more complicated. It is often difficult for home owners to visualize what their home will look like from a set of plans. It’s a good idea to walk through areas that are fully baled with the homeowners before you apply the interior mesh. This will help them see how the addition of a niche will affect the design of their home. It is important for niches to appear somewhat symmetrical when more than one will be employed in a design, especially when they are placed near each other. A little bit of variation from one to the other is fine; however, a dramatic dissimilarity will appear unprofessional and may draw the wrong kind of attention. To keep the shapes similar, use a template. For every niche I create, I use a piece of scrap plywood, cut to the desired shape. That way, when I move from one location to another, the shape that I start with will always be the same. Once the template is made, place it on the wall in the rough location you have chosen. 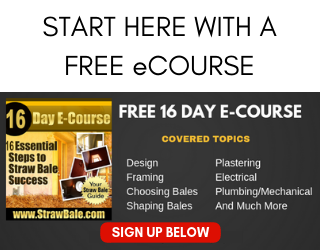 Try to locate the bottom of the niche at the top of a bale (the line created between bale courses). When you cut out the niche, the top of the bale will make for a flat base for the niche. Use two 6″ landscape pins to hold the bottom corners of the template in place. A bent pin at the center of the arch (assuming an arched niche) will support the top of the template. Once you have confirmed the location, use spray paint to outline the template. When you remove the template from the wall, the spray paint shows you where to cut. Use a chainsaw or a grinder with a Lancelot blade to cut out the niche. Be careful not to cut too deep or too shallow. Keep in mind that the three coats of plaster will shallow the niche by about 1 ½”. Be sure to fully wire the niche with the welded wire mesh and or plaster lath, lapping over and tying to the wall mesh. Use the plaster to slope the base of the niche slightly out if you intend to place plants or other items that require watering so that any excess water can run off the walls, not back into them. For any other niche, slope the plaster slightly towards the back so candle wax or other materials that spill will not stain the wall surface. 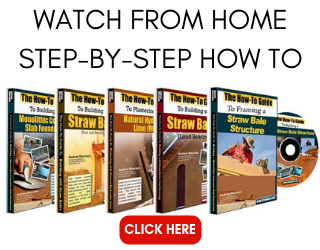 Andrew Morrison has a passion for straw bale construction that is matched only by his desire to teach his knowledge to others. He has a wealth of experience in designing and building both conventional and straw bale homes. After years of building, he has moved his practice entirely to consulting and teaching. He shares his knowledge with thousands of people via his DVD series and this website and teaches roughly six-eight hands on workshops each year. 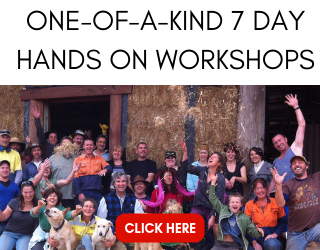 For more on his workshops, please visit www.strawbale.com/store/category/workshops. Andrew received a BA degree from Hampshire College in 1995 for Glacial Geology. He also has a degree in construction technology.